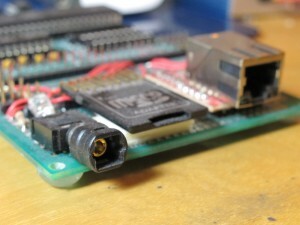 This project is actually remarkably similar to the IOIO, but actually his was announced first 🙂 Both projects appear to be using a single-chip solution for USB, but on the IOIO that means using a PIC that has built-in USB, whereas on this project spiritplumber used my software USB implementation for the Prop. Currently the IOIO is a $50 commercial product, whereas this Propeller project could be built for maybe $15. It’s possible the IOIO might get cheaper once the design is opened up in the future, but for now this might be a good alternative for anyone who wants to play with an IOIO but either can’t get their hands on one, doesn’t want to pay fifty bucks for it, or who wants something that interfaces well with other Propeller objects. He’s been getting a bit discouraged by the lack of community response, so if you’re interested at all I’d encourage you to jump in and join the discussion! His project was just featured on Hack a Day, and there’s an active discussion thread over on the Propeller forums, including links to his source code releases so far. 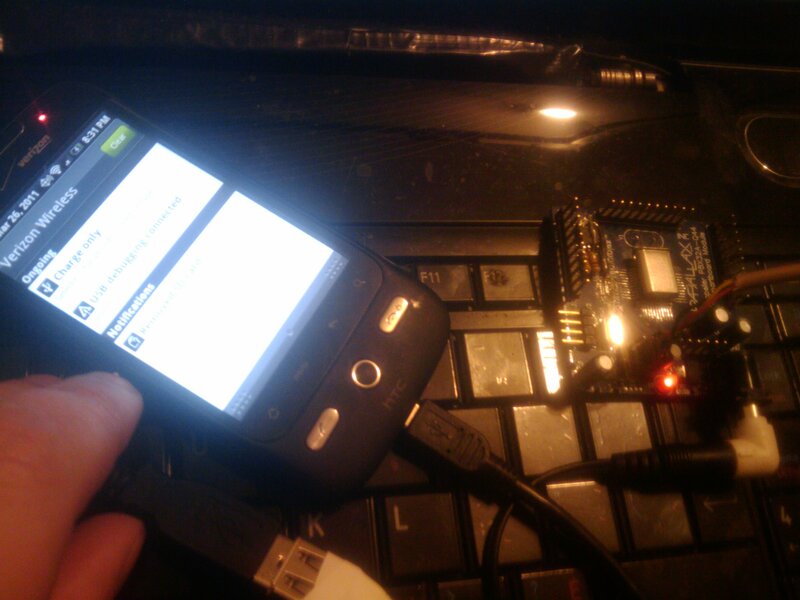 This entry was posted in Propeller and tagged android, usb on May 1, 2011 by Micah. 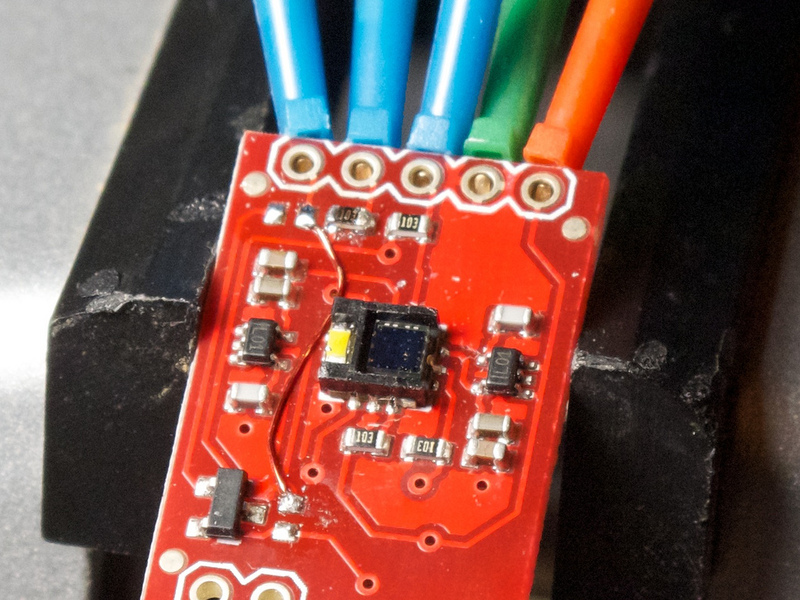 A few years ago, I implemented an S/PDIF encoder object for the Parallax Propeller. When I first wrote this object, I wrote only a very terse blog post on the subject. I rather like the simplicity and effectiveness of this project, so I thought I’d write a more detailed explanation for anyone who’s curious about the gritty details. The source code is open, under an MIT-style license. If you’re a fellow Propeller fan, it’s pretty easy to use this code to give your next sound project a digital output. If not, read on… perhaps you will be inspired to try exploring digital audio on a different microcontroller platform! 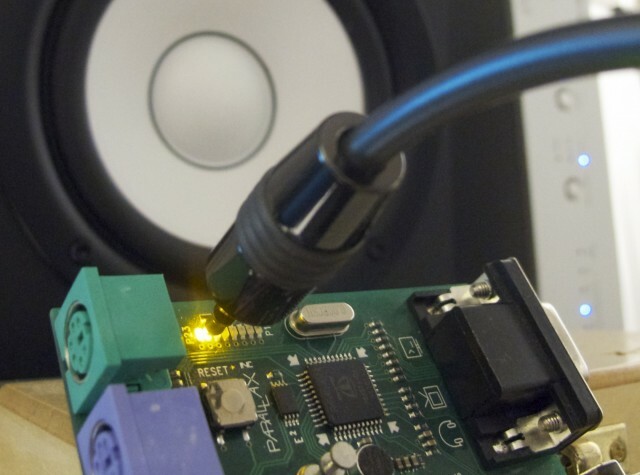 Starting from the very basics… what is S/PDIF, and why would we even want to generate it directly from a microcontroller? Microcontroller audio projects are getting more and more popular, especially as legions of Arduino hackers build DIY drum machines, noise makers, 8-bit synthesizers, and so on. Many of these bit-bang low-fi audio in software. Some of them use external analog synthesizers, MP3 decoders, or other support ICs. If you wanted high-fidelity audio, though, your options get more limited. Some microcontrollers (like the Propeller) can perform PWM at a high enough frequency to produce reasonable audio quality. But this is still no match for an external DAC, much less a high-quality external DAC. So, if you’re really trying to produce higher quality audio without a lot of extra fuss or expense, it makes some sense to let someone else do the job. If you have a hi-fi stereo receiver, you already have an external DAC and a good way to communicate with it. Nearly all consumer audio receivers now include digital audio inputs based on the Sony/Phillips Digital Interconnect Format (S/PDIF) standard. This consumer standard is actually a variant of the professional AES3 standard. Electrically, this is a high speed unidirectional serial link with a clock that runs at a high multiple of the audio sample rate. The physical transport can be a low-voltage signal over 75-ohm coax, or it could be optical. Optical interconnects (with TOSLINK connectors) are especially common, and to transmit these signals all you need is an LED. For every audio sample. this digital signal transmits all of the bits in the sample, as well as some control information. Also, quite importantly in fact, it transmits the timing of these samples. The DAC synchronizes its conversion cycles to the time-of-arrival of each sample that comes over the digital bitstream. So, the analog timing characteristics inherent in this digital signal can also influence the resulting analog signal. Sound nerds tend to get fabulously stressed out over jitter and wander and so on— names for different kinds of deviations from optimal bit timings. It’s good to keep in mind that, by nature, S/PDIF is a much more real-timey sort of signal than your average serial data link. But unless you’re the sort of hopeless audiophile who spends more on your amplifier power cables than I’d spend on a car, you probably shouldn’t get too bent out of shape over a few nanoseconds here or there. S/PDIF uses a serial signal clocked at 64x the audio sample rate. So, for 48 kHz audio, we need a serial signal at a whopping 3.072 megabits per second! 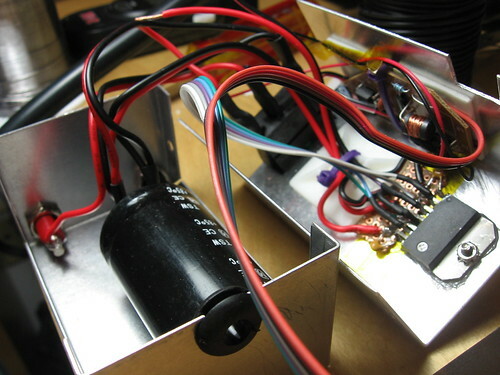 However, the receiver doesn’t just need the bits, it also needs a clock. Since we only have one electrical or optical signal to work with, both the clock and data have to be recoverable from this one signal. S/PDIF does this using Biphase Mark encoding, which is a close relative of Manchester code. Because of this coding, we actually have to transmit on a clock rate which is 2x the bit rate. So, again for 48 kHz audio, we need a transmit clock of 6.144 MHz. But wait, why 64x the sample rate? Even if we’re transmitting stereo audio at 24 bits per sample, that’s only 48 bits. Where do the other bits go? So many bits… what does it all mean??? The preamble identifies the type of subframe, as we’ll see below. It is the only part of the stream which is not biphase-mark encoded. It is the only place where we’ll see a run of three clock cycles with no bit transitions, so this allows the receiver to uniquely identify the preamble within the received bitstream. Each subframe includes 24 bits of audio data, transmitted LSB-first and biphase-mark encoded. The low 4 bits of this stream may be used for other purposes, depending on which standard you’re reading. 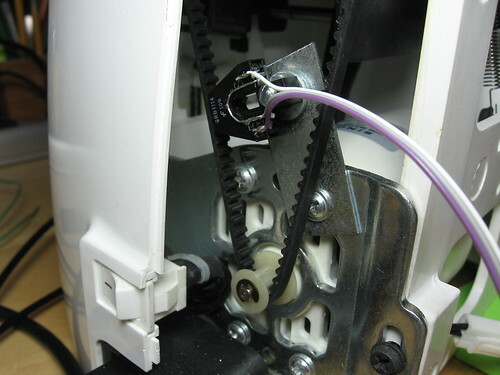 The Valid bit indicates that this subframe contains valid sample data, and it is okay to output. In practice this bit isn’t really useful, since with the advent of Dolby compressed audio over S/PDIF, the receiver has a lot more work to do in order to determine if the data is valid uncompressed audio. The User and Control bits are both part of a lower-bandwidth serial stream that we’ll see later. And finally, each subframe has a Parity bit to help detect single-bit errors. The User and Control bits on each channel collectively form four low-bandwidth serial channels, each running at a rate of one bit per sample. In S/PDIF, the User bit is unused, and the Control bits on each channel transmit a 192-bit Channel Status word. This word is fully transmitted once per block where a block is defined as a group of 192 frames beginning with a Z preamble. In the professional AES3 protocol, there is a lot of data packed into this status word. But S/PDIF uses it for very little. In fact, only 13 of these bits are used at all, and in practice there isn’t really anything useful in this word. AES3 encodes an exact sample rate here, but in S/PDIF the only indication of sample rate is the clock recovered from the S/PDIF bitstream itself. Wow, so far this looks pretty easy. Well, except for the high bit rate, and the picky timing. But what about this biphase mark code? There are a few different ways to think of biphase mark encoding. If you’re familiar with Frequency Shift Keying (FSK) modulation, it might make sense to think of BMC as a particular form of FSK. A string of ones would be encoded as a square wave at a frequency equal to the original bit rate. A string of zeros would be a square wave at half that frequency. Put another way, you can think of BMC in terms of bit transitions. A zero bit is encoded by a transition followed by a non-transition, whereas a one bit turns into two transitions. This demystifies BMC a bit… but why do it at all? Well, like any protocol which has to travel over some kind of analog physical media, very low-frequency signals (down to and including DC) can be troublesome. Let’s say we’re using an optical TOSLINK cable to transmit S/PDIF, and we have two theoretical bitstreams. One of them always transmits “one” bits, the other always transmits “zero” bits. The first bitstream means the transmitter’s LED is always on, and the second means the LED is always off. How does the receiver tell these two streams apart? At first it seems obvious. The “one” stream is brighter than the “zero” stream. But actually, this might not be true. Maybe the first stream has a very dim light or a long cable. Maybe the second stream has a light leak around the receiver. It’s unreliable to rely on any absolute amount of light to discriminate ones from zeros, and in fact it’s not that hard to imagine situations where one system’s zero is brighter than another system’s one. Similar problems exist in many kinds of analog transmission problems. Radio receivers, for example, need to deal with a very wide range of signal strengths. Unbalanced coaxial cables, such as S/PDIF over copper, can face similar problems. 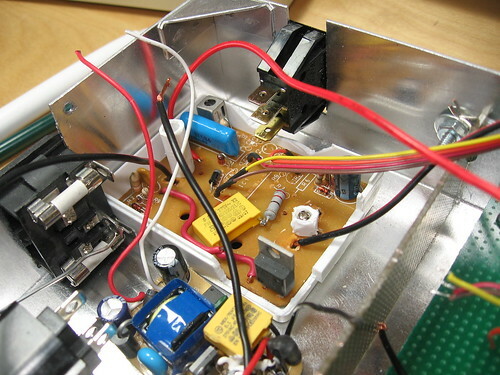 The receiver circuit in each of these cases needs to employ some kind of automatic gain control (AGC). AGC circuits track the average power level of the received signal, and “center” the one/zero discrimination threshold around this value. It’s a simplification, but AGC circuits can also be thought of as high-pass filters, since they subtract the unknown DC bias in the received signal. Since DC signals are removed by the receiver, we can’t use them to carry any useful data. Those hypothetical all-zero or all-one bitstreams would be a disaster, since the receiver would continuously detect a signal level equal to the average. Any tiny amount of electrical noise would be detected as a one or zero. Now it’s easy to see that BMC is in fact shifting the signal up in the frequency domain. It needs twice the bandwidth now, but the center frequency is now near the bit rate, and we no longer have any signal at DC. Hooray, no more grumpy receiver AGC. My platform of choice for this project was the multi-core Parallax Propeller, since it’s simple and hobbyist-friendly yet it also has features which directly address these challenges. The XMOS XCore, another parallel microcontroller, would also be a fabulous choice. It may also be possible to implement S/PDIF on a sufficiently fast single-core microcontroller. Unfortunately, an 8-bit µC like the AVR used in the popular Arduino board probably wouldn’t be fast enough. A multi-core microcontroller makes challenge (1) a piece of cake. On the Propeller, one of the eight CPU cores can be dedicated to S/PDIF encoding. The other seven are available for application code, sound streaming or synthesis, and for other I/O devices. Challenges (2) and (3) can be mitigated if we have a little bit of help from hardware. If we were using traditional bit-banging, and toggling I/O pins in code, a very fast processor would be needed. Even if the encoding and output could be done in four instructions per bit, just the S/PDIF encoding would require a little over 24 MIPS of processing power. Annoyingly, the CPU clock would have to be run at a multiple of the audio bit rate. You would have no way to use a separate clock. But if we had some hardware to shift out bits at the right time, the CPU can spend that time doing other tasks. 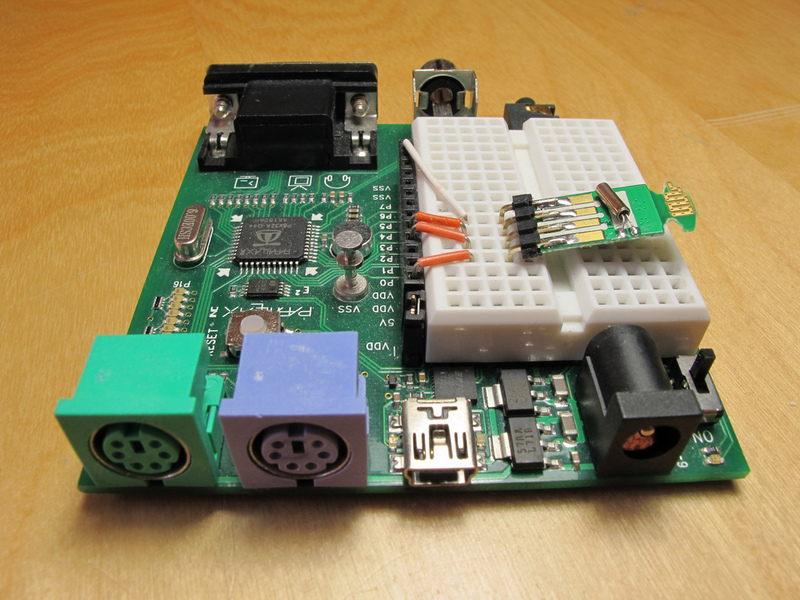 Many microcontrollers have an SPI port that may be able to do the job. The XCore actually has special-purpose shift register hardware just to help with high-speed I/O tasks like this. And the Propeller has something close enough— a “video generator” that can be configured as a latch and shift register. The Propeller’s video generator can be clocked by a PLL that we program to synthesize the audio bitstream clock.
' 32 cells) of a subframe.
' odd numbered non-preamble bit.
' additional transitions every time there's a 1 bit in our input.
' 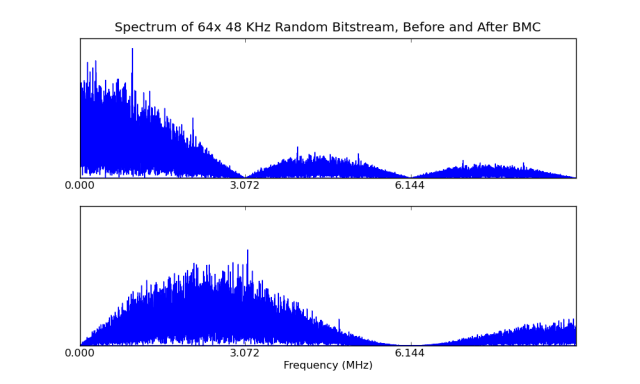 48 KHz, we have less than three instructions per bit! if_nc     xor     biphase, mask_4     ' Insert a transition only for '1' bits.
' 'biphase' before encoding the rest of a subframe.
' bit, these preambles are inverted.
' transitions in the same operation.
' For speed, we precalculate all XOR masks. This code really does most of the work. The waitvid instruction waits until the video generator has buffer space available for another 32-bit word, but the video generator is actually clocking out data continuously, without any gaps. Since the biphase mark encoder’s output for one subframe is 64 bits, we split the subframe into two halves and process them each as above. The first half is special, though, since the preamble is not biphase mark coded. Edit: I should mention that in most cases it probably makes more sense to use a 4-bit or 8-bit lookup table to do the BMC encoding. This approach seemed to make sense on the Propeller. 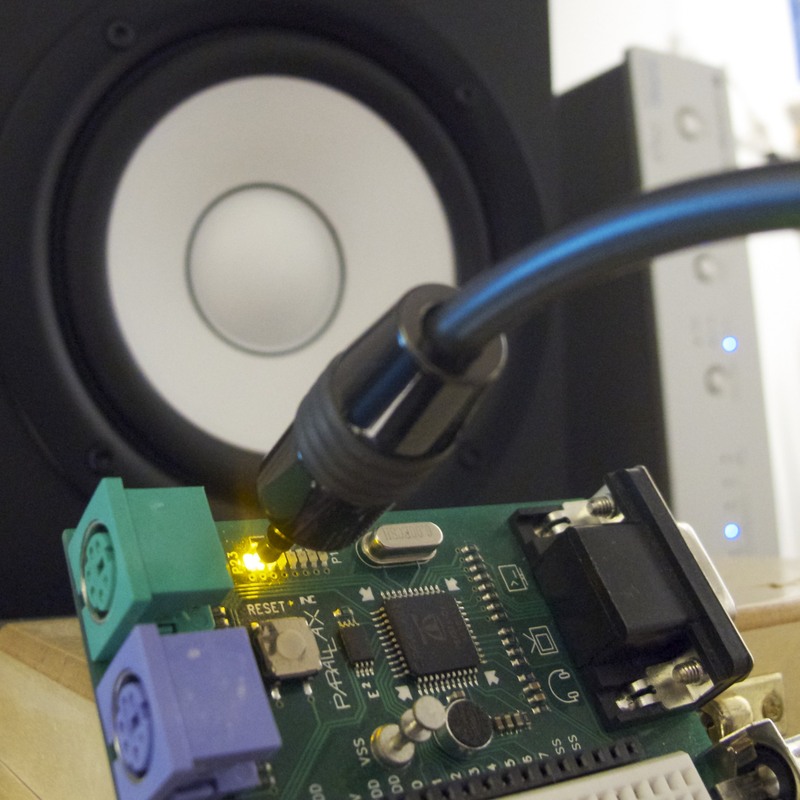 However, for example, the S/PDIF library by XMOS uses a 4-bit table to do the conversion. To use this SpdifOut object in your own Propeller project, you’ll need another cog to supply data to the S/PDIF cog. The object can receive sound samples one long at a time from hub memory, or you can set up a FIFO buffer for transferring data in more of a bursty fashion. In fact, transferring samples one-at-a-time is really the same thing as creating a one-entry FIFO buffer. Since we read from the SD card in large blocks, this code uses a double-buffering scheme. While we’re reading one block from the SD card, the other block is being played by the spdifOut module. To represent these two buffers as a FIFO for spdifOut, we just place them consecutively in memory. We can tell which buffer spdifOut is currently playing by looking at the low bits of its played-sample count. A note about the WAV header: Any modern S/PDIF receiver will actually mute the received audio for a fraction of a second, while it detects whether the bitstream is using Dolby Digital compression. Older receivers without this feature would be in danger of damaging the speakers or amplifier if anyone mistakenly sent them a compressed bitstream they couldn’t handle. Assuming your receiver has this feature, there’s nothing to worry about. If you do have a receiver which starts playing the very first sample you get, you’ll need to be much more careful about the initial conditions. For example, you won’t want to start the S/PDIF cog until the buffer has some valid data in it.
' current tone frequency, and the high bits of "accumulator"
' are used to generate a signed 16-bit audio sample. wrlong   t2, buffer_addr           ' Write the next sample now! The full source code is available on the Object Exchange or in my Subversion repository. I enjoyed giving one of my favorite microcontrollers a new kind of output device, and I’m looking forward to seeing what others come up with for the Propeller as well as for other microcontrollers. 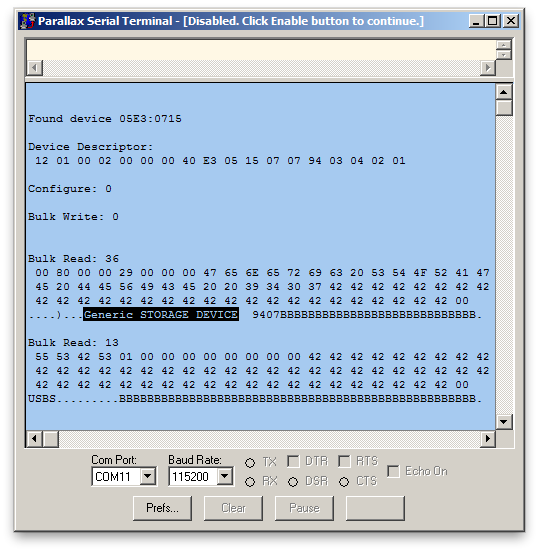 This entry was posted in Portfolio, Propeller and tagged assembly, bit-banging, hacks, microcontroller on April 28, 2011 by Micah. This is another sub-experiment leading up to a project that I’ve only tangentially mentioned on this blog so far: a robot that automatically sorts and places Perler Beads. The robot starts with a pile of unsorted beads, and after it separates them into single beads, it needs a way to accurately sense the color of each individual bead. The sensor has a built-in A/D converter with a simple I2C interface. I chose to use a Propeller prototyping board for the test, and display the resulting colors on my PC. For my test, I wanted to continuously compensate for ambient light, and just measure the light reflected off of the bead. So I integrate the sensed light levels twice, once with the LED off and once with it on, then I subtract them. A little scaling and white balance calibration, and I have an RGB color suitable for display on a monitor. The calibration is certainly nothing scientific, but it’s more than enough to get a visibly recognizable color, and I’m hoping it should be plenty accurate enough to differentiate the various bead colors. 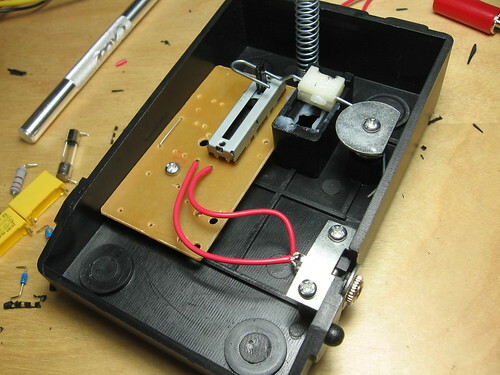 This entry was posted in Propeller, Random Hacks on February 15, 2011 by Micah. This is a continuation of my experiments in bit-banging full-speed USB on the Propeller. I have the basic host controller working reasonably well now, so I started trying to do something a bit more “useful” with it by implementing a simple Bluetooth stack on top of it. 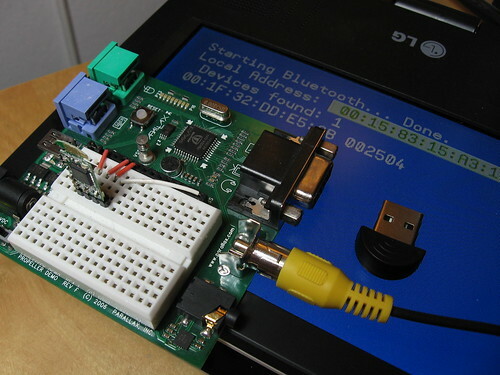 Bluetooth and USB are both quite complicated, and this project is implementing only tiny fractions of each specification. 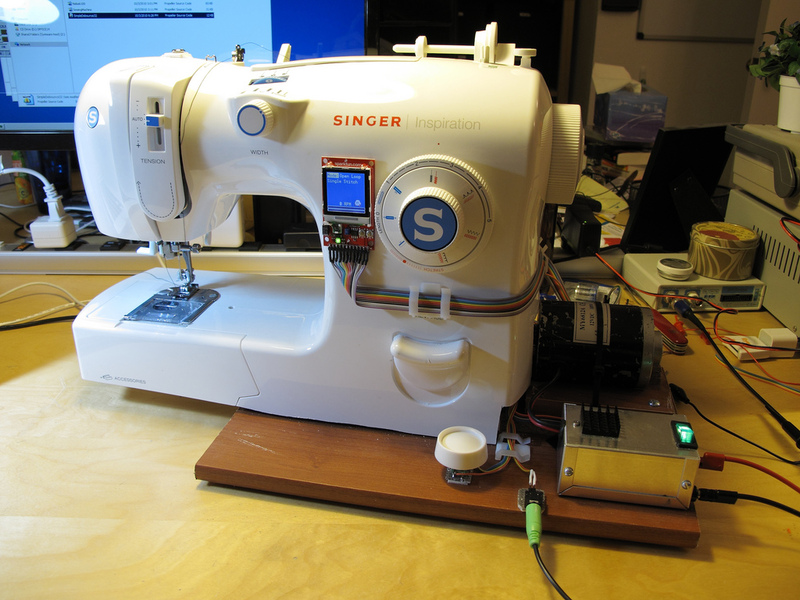 But I think it’s enough to show that the functionality you actually need in a simple embedded application isn’t that complex- and a lot of the cheap consumer electronics you can get nowadays might actually be more hobbyist-accessable than they appear. That’s a Propeller demo board, the $2 dongle (stripped down and attached to a 4-pin header, for convenience) and no other components. The demo here is just scanning for nearby devices, but I also have some basic L2CAP support and I’m working on the SDP server. Currently the stack uses 4 cogs (3 for USB, 1 for Bluetooth) and 12 kB of RAM, but I’m hoping to optimize it. The software is very much a work-in-progress, but you can find it in the Subversion repository, with an MIT-style license. 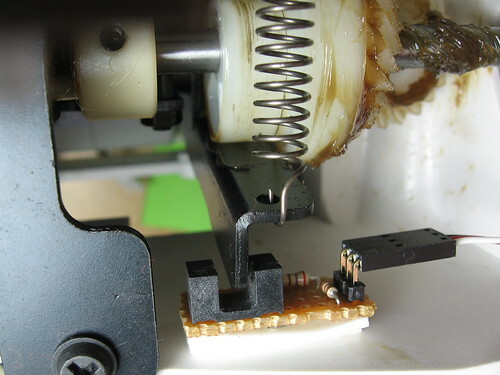 This entry was posted in Portfolio, Propeller, Wireless Sensors and tagged bit-banging, bluetooth, propeller, wireless on April 19, 2010 by Micah. This is one of those things that people have said was impossible, and I’ve wanted to try it for a while. I finally found an excuse. I wanted a way to build more cheap wireless networked devices. You can get bluetooth and wifi adapters that are microcontroller-friendly, but it’s a niche market so you’ll pay a lot. I wanted a way to use the $2 bluetooth dongles and $10 wifi adapters you can easily find online or at your local electronics shop. But these devices are all USB, and USB host controllers aren’t yet common on small hobbyist-friendly microcontrollers like the Arduino and Propeller. So, I decided I’d see if it was possible to implement a USB host controller entirely in software on the Parallax Propeller microcontroller. Turns out that it is. This still needs more development before it’s generally useful, but it’s already showing potential. Of course there’s a long list of caveats on something that pushes the limits of both the Propeller and the USB spec, but none of them should be deal-breakers for most applications. If you’re interested in helping with or following the project’s development, there’s a thread on the Parallax forums. The latest source code is in my usb-host Subversion repo. 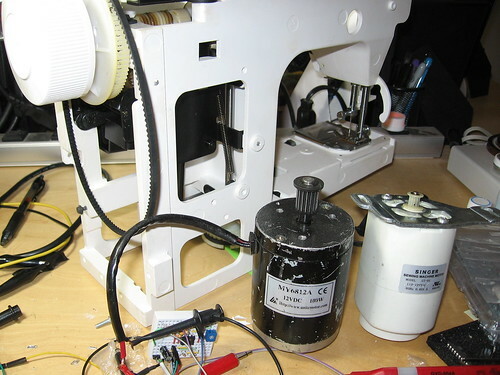 This entry was posted in Propeller and tagged bit-banging, usb on April 1, 2010 by Micah. Propeller chip + SPDIF = ??? Maybe I’ll give my Propeller board an Ethernet port and build a Squeezebox-on-a-chip. 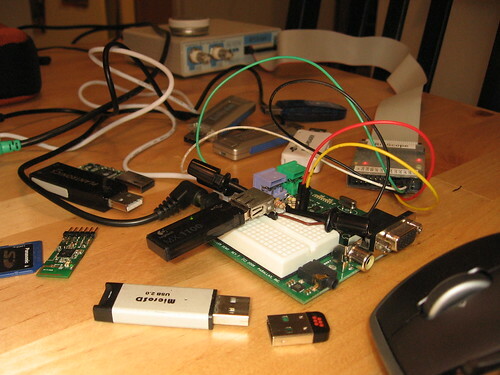 This entry was posted in Propeller and tagged audio, ethernet, microcontroller, parallax, propeller, spdif on July 26, 2008 by Micah.